Ever since I purchased these sandals in December, I’ve been wanting to share how I’d wear them with jeans! 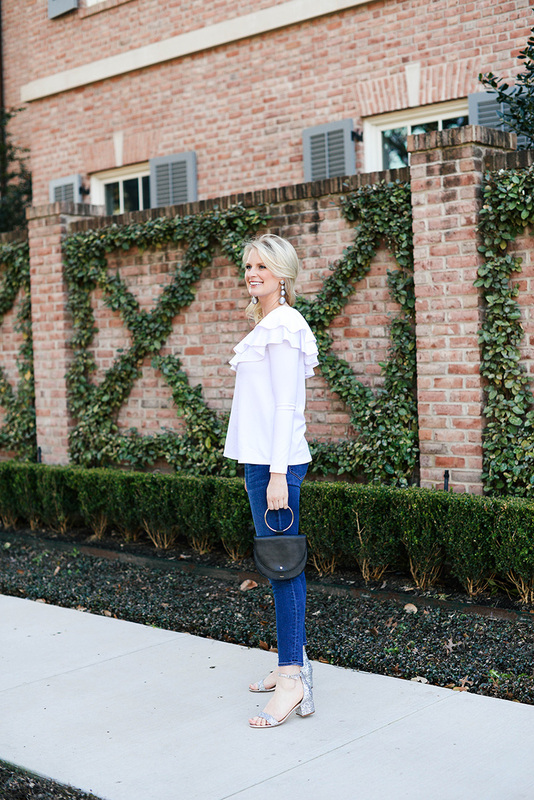 It finally warmed up for a bit a couple weeks ago, so I got to wear them out to dinner with this white ruffle top (a new fave!). 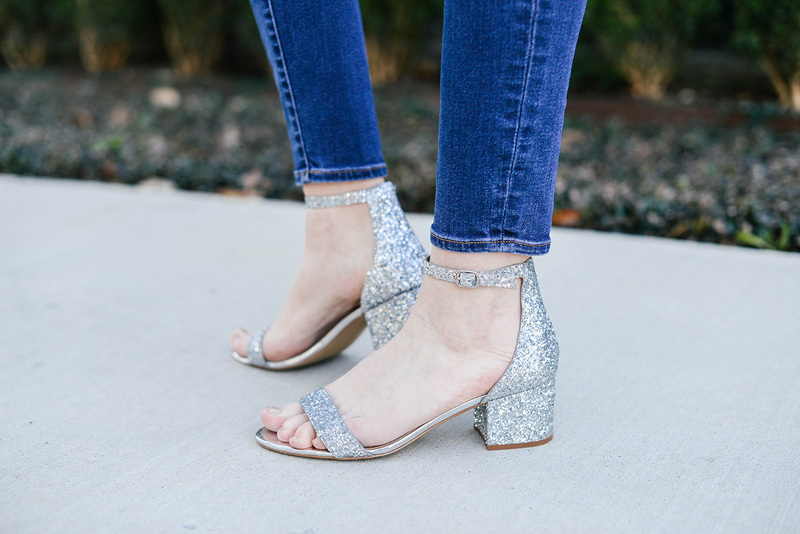 While they certainly are the perfect party shoe, I absolutely love dressing them down with jeans. Now onto the top… you’re probably wondering why I’m wearing something that looks so spring in February? 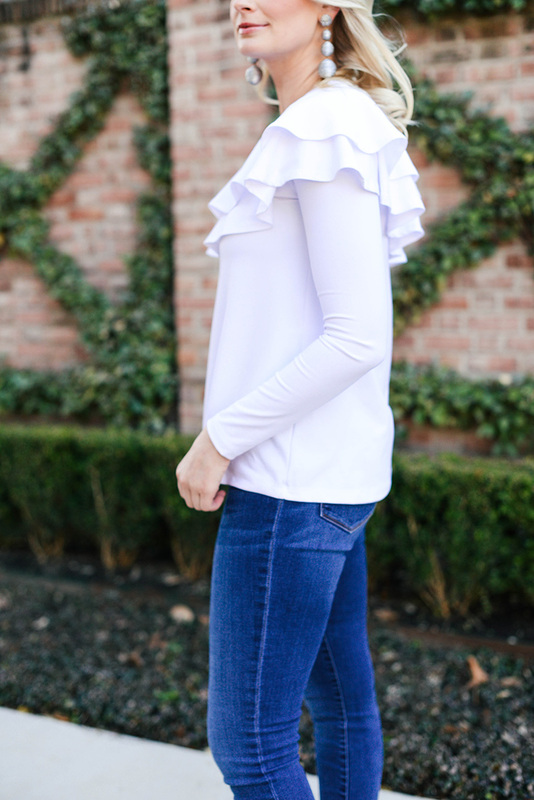 What makes this top special (aside from the adorable ruffle and one-shoulder style, of course), is it’s made of a heavier jersey knit fabric. It’s the ideal top to wear now through spring, when the temps are still a little too low to go short-sleeve or with a lighter fabric sans jacket. The jersey is so soft and comfy! Also, unlike a lot of Susana Monaco’s other jersey pieces, this piece is only fitted at the top and loose through the waist. Finally, a top that’s flirty and flattering… that will allow you to eat that extra piece of pizza on date night. This tie-sleeve tee is such a cute piece for everyday wear! This sleeveless one-shoulder top is similar to the one above in black! Great for date night or wearing with shorts this summer. A simple, fitted off-the-shoulder top you can tuck into high-waisted jeans, skirts, shorts and more. 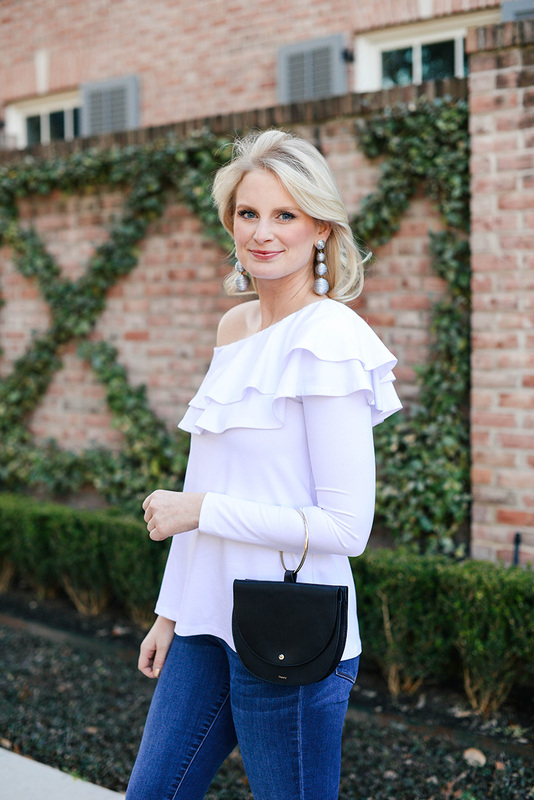 This open shoulder top is another fun date night find for the next few months! PS: my Theory bag is BACK IN STOCK in black! Run, don’t walk. This top is so cute and I love that it’s not oversize like most ruffle top. Obsessed with that top and those shoes. This outfit is amazing! love this top! 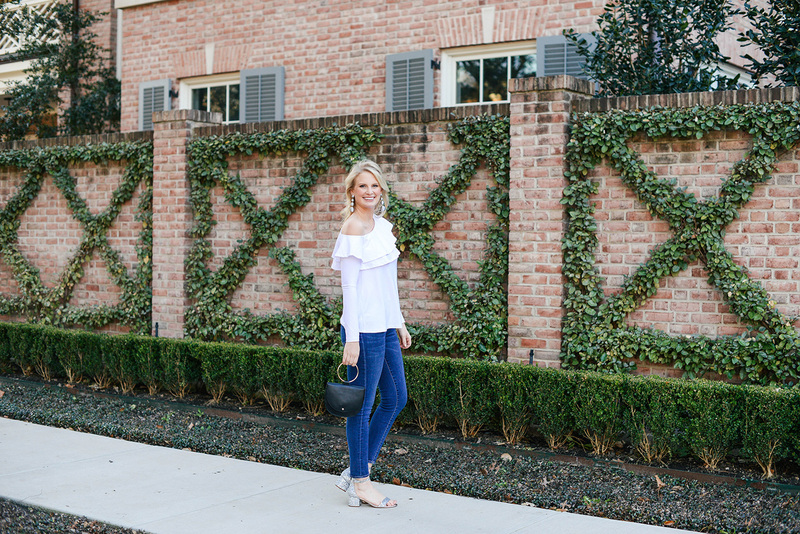 A white top paired with a great pair of jeans is always one of my favorite style formulas. You look amazing, Merritt! Love the touch of sparkle! I love the ruffle detailing on your top! And those glittery shoes are super cute! Love this look so much! Your blog is one of my favorites, and I love following all of your social channels. It’s so refreshing to see someone being so real and honest with their followers! PS — just made your shishito pepper recipe for an afternoon snack. So yummy! Hi Hillary! Thank you so so much for your feedback – I’m so glad you’re enjoying my blog and following along on social!! Aren’t those peppers delish?! What an adorable top, I love the simplicity of this look. Perfect for this erratic weather we’ve been having in Texas!